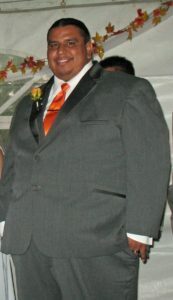 Joel Matthew Kennedy is a member of the Oneida Nation of the Thames and is Bear Clan. He grew up in London and has worked at N’Amerind Friendship Centre for 10 years. 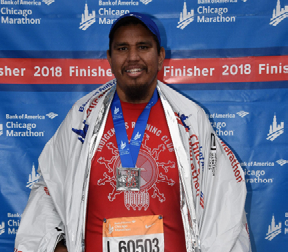 In October 2015 Joel decided to take control of his health losing over 115lbs and finishing his first marathon within three years. He is an avid runner starting from doing the couch-to-5k program and believes that running is for everyone. Joel is currently training for Around The Bay 30km event in March and will be doing the Chicago Marathon for the second time in October. The two sports/physical activities I enjoy are running and volleyball. I began playing volleyball at the Friendship Centre in my twenties and have continued playing since. I take an active role in organizing teams for leagues (coed and Men’s) as well I continue to organize and play in volleyball tournaments. Running for me is a passion I found and it has helped me on my journey to live a healthier lifestyle. In October 2015 I was highly overweight and began changing my eating habits and started walking. After losing 50lbs I found my passion in running when I started a couch-to-5K program in April 2016. I made a goal that I wanted to finish a 5K without stopping by October that year. After reaching my goal at the 2ndAnnual Messenger Run in June 2016, I decided to make my next goal to run a 10K. After completing another app based training program I finished my first 10K at the Longboat Toronto Island Run in September 2016. While continuing to maintain my 10K distance and finishing two more 10K events I decided to challenge myself and registered for my first half marathon. I began training in January 2017 and finished my first half marathon in March 2017 in Syracuse. I was not quite happy with how I did as I struggled to finish and gave it another shot in April 2017. I joined a training clinic through a local running store, Runners’ Choice, and trained for my third half marathon. 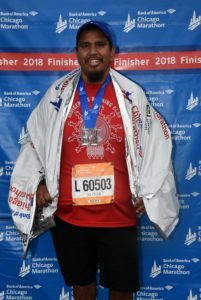 I set a time goal and with 18 weeks of training I finished strong completing my third half marathon within my time goal. The next challenge I set for myself was the finish Around The Bay 30km road race. I continued to train with and finished Around the Bay in March 2018 being very happy with how I completed it. Even before finishing Around The Bay I decided to enter my name for the Chicago Marathon lottery and was successfully selected. I trained for 15 weeks and three weeks before the marathon I injured myself (unrelated to running) spraining my ankle. It was a hard decision to make but I decided to give it my best shot and entered the marathon. I was able to maintain the ability to do a slow run for the first half but started to feel the effects of modifying my stride and had to push myself to finish the second half. It was very difficult physically, mentally and emotionally but I was able to finish. I took some time off afterwards and have since returned to training, after doing physiotherapy, at the end of December. I define wellness as holistic (physical, mental, emotional and spiritual) and try to maintain a healthy balance in every aspect. I noticed that I was physically out of balance and decided to make an effort to change. Early on I got caught up in what the scale said as opposed to focusing how much better I was feeling. I find that I need to reflect on where I am in my journey to appreciate where I have come from. I look at wellness as a lifestyle and understand that it takes time and commitment to change to a healthy way of living. Becoming physically healthier has also helped me find balance in other aspects of myself. I work on making healthy choices daily while maintaining a training schedule of running three times a week as well playing volleyball. I found that sharing my journey keeps me motivated and I try to do so when I have the opportunity. The message I try to share is ‘if I can change my lifestyle anyone can’. In April 2016 I created the Indigenous Running Club out of N’Amerind Friendship Centre to offer a club for Indigenous people to come together to train. The group goes from the beginning of April until the end of October each year. To date we have had three members complete their very first marathon, eight complete their first half marathon and many finish their first 10k & 5K distances. For some it is an opportunity to come be active by walking or running with a group on a weekly basis. Our club was featured on CBC in July 2018 and also shared on CBC’s Radio show Unreserved in October 2018. In January 2018, along with some members, we started the Indigenous Running Club Healthy Selfie Challenge where Indigenous people actively share their selfies after finishing a physical activity, on a Facebook group page. It has been very active since it was created and continues to grow in members. I found this helps each other become or stay motivated to be active. It also gives people an opportunity to see different ways to stay active from people of many different fitness levels. Throughout my adult life I always found myself creating opportunities and enjoy organizing. My brother was one of my inspirations, he lost 80lbs while changing his eating habits and took up running, finishing his first half marathon in 2013. He showed me that it is possible. Trying it for the first time in 2013 it wasn’t until 2016 that I found a passion for running. My biggest motivation was the fear of diabetes, which runs in my family. It was a conversation at a friend’s birthday dinner that made me realize it can happen at any age. That was the final deciding factor to make the lifestyle change while it was still an option. Since then I have made a huge effort in changing my lifestyle and can happily say at my last visit my doctor says I am in good health.